How to Send Money through Paytm Wallet?, How to Transfer Money from Paytm? You can transfer money from your debit card, net banking or credit card that can be used for offline & online payment through Paytm wallet. By using Paytm to send money, you can save your precious time from huge rush for money withdrawal at banks and ATM. Paytm has a nice user interface by which a layman could also do send money using paytm wallet quite easily. 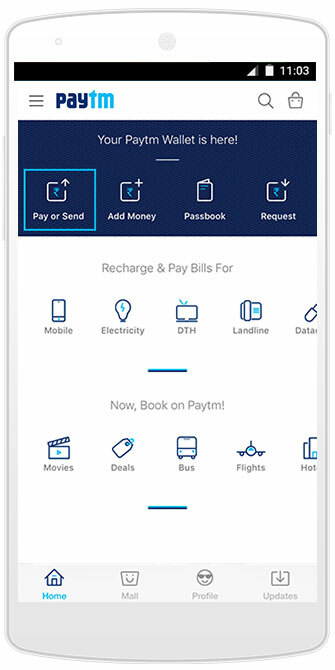 You just need a smartphone, internet connection to add money to paytm wallet. If you already have cash in your paytm wallet, it would be great otherwise you can easily add money to paytm wallet. With this, you can help your near and dear ones in troublesome times to easily transfer money to their paytm wallet. This procedure of sending money to friends via paytm wallet is completely secure and you can trust Paytm. Paytm wallet can be used to send money to your friends & family via Paytm wallet from website as well as mobile application. As of now, Paytm allows to add upto Rs. 10,000 in a month in its wallet and if you want to increase this monthly limit, then, that can be achieved after your KYC (Know Your Customer) process is done. Paytm is currently running a promotional offer where every Paytm user will get assured cashback every time they send money. A user thus can earn up to Rs.500 cashback on a daily basis. Today more than 28 Crore Indians use Paytm to transfer money to each other. If you wish to send money using Paytm, you must note that it is instant and free for any Paytm user who wish to send money to family or friends. Scan the recipient’s QR code or enter their mobile number in the ‘Pay’ option of your Paytm app. Enter the amount you want to transfer and tap on ‘Pay’. Your money will be instantly transferred from your Paytm Wallet to the recipient’s Wallet. The beneficiary will receive a message on his/her mobile number, showing a successful transfer. You can see how simple it is to transfer money to paytm wallet or send money from paytm website. Ab ATM nahi #PaytmKaro!